But we're lost and alone! 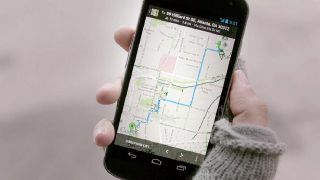 Eric Schmidt has revealed that Google hasn't "done anything" about a replacement Google Maps app for iOS 6 on the iPhone 5. Apple ditched Google in favour of its own maps app which hasn't exactly gone down as well as the fruity company would have hoped. But if Google's indulging in a spot of schadenfreude, Schmidt is staying diplomatic about the situation. He told reporters in Japan: "We think it would have been better if they had kept ours. But what do I know? What were we going to do, force them not to change their mind? It's their call." As for a Google-made replacement, he said, "We have not done anything yet. I'm not doing any predictions. "We want them to be our partner. We welcome that. I'm not going to speculate at all what they're going to do. They can answer that question as they see fit." But he did have time for one little, hastily retracted dig when using the Google Nexus 7 to show off a cool new touch-free map control feature. "Take that Apple," he said, swiftly followed by, "That was a joke by the way." But one of those jokes you actually mean too, right Schmidt? If you're struggling to find your way anywhere with the iOS 6 Maps app, one hacker has managed to port Google Maps to the iPhone - although you'll need a jailbroken handset and a time machine to get to the future when he's made it available to the public.